Red Hot Patriot, which ends its Arena Stage run Sunday, met most of my expectations, even the rueful ones. Mostly, it reminded me how much I regret never having met Molly Ivins in person despite our having at least a dozen mutual acquaintances. Its particulars also evoked what is already regarded as the last heyday of the glorious/terrible American newspaper trade when it was still able to attract, nurture, shelter and, most of all, break the hearts, if not the spirits of romantics such as Molly Ivins. Lest you think I’m being in any way dismissive, allow me an urgent shout-out to everyone I ever shared a newsroom with: Whatever good things you heard about Kathleen Turner’s performance can be verified in this shabby corner of the web, and if Red Hot Patriot happens to show up in your immediate neighborhood, you shouldn’t wait a second after it lands to check it out. You’ll come away with the same bittersweet regrets I did. But mostly you’ll feel as though you got to spend a bit of hang time with the real Molly after all, if by proxy. It’s been weeks since I saw the show. Yet I’m only now writing about it because, as thoroughly as I enjoyed Patriot, there was something discomfiting that chewed at me throughout. And it was crystallized today by some random acts of idiocy occurring within the previous 24-hour news cycle that need not be re-hashed, except here. Or here. Or even here. I am trying harder than ever to maintain even that much equanimity as this year’s campaign-from-hell staggers and wobbles along the back-nine. Somehow, laughter, however sardonic or withering, seems too good for the Mourdocks, Akins, Palins, and Trumps. 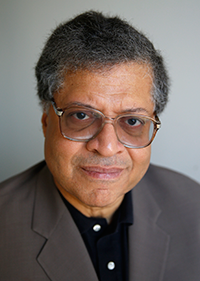 It certainly is too good for the crowd that agreed not long ago that African Americans were better off under slavery. Which is just about the time I stopped finding these zealots funny. Laughing at their monstrous idiocy may not be the same as sanctioning it. But it’s a distraction from acknowledging just how dangerous these zealots are. My loss of equanimity is neither a joy nor a relief. I cherish the example of Murray Kempton, as fierce and funny a practitioner of the 800-word screed as Ivins though a much different breed of stylist who habitually probed beneath the darkest and meanest of souls to find a glimmer of good. But I like to think even he had his limits with yotzes. Ivins certainly did. Neil Armstrong is dead, and so for the time being is any substantial effort by America to put people in space. People forget to be dismissive or incredulous about manned-space-travel when they realize the shuttle’s never flying again – or when someone like Armstrong joins the ancestors. His impulse to spurn the glare of celebrity-hood was duly noted and even praised by a culture that not too many years before (in part because of this semi-reclusive nature posthumously hailed as a virtue) would have easily mistaken him for any of the other men who flew during what we nostalgically term, “The Space Age.” If you asked the average American to name an astronaut from the 1960s, they would likely have mentioned Armstrong for being The First Earthling on the Moon, but more likely would have named that archetypical all-American hero John Glenn and even James Lovell, who was some guy Tom Hanks played in a movie. Fifty years ago tomorrow morning, just as I was heading off to school, the man who would become my favorite among all the astronauts took his turn to ride a Mercury spacecraft into orbit. 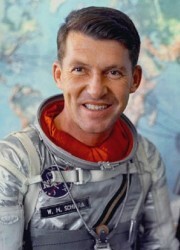 Wally Schirra’s nine-hour, six-orbit flight about Sigma 7 wasn’t noteworthy for setting any world records. (The Russians had by then quadrupled our relatively meager number of manned orbits. It somehow seemed more fun in the days when we had some catching up to do.) Nor was it distinguished by any hair-raising crisis or daredevil flourishes. Indeed, the near-elegant perfection of Schirra’s Mercury flight from lift-off to his precisely-timed splashdown was far more appreciated by engineers than by the general public. Never was Schirra’s Ultimate Cool more conspicuous than on the morning of December 12, 1965 when he and Thomas Stafford were supposed to have lifted off the pad in Gemini 6 for a history-making rendezvous mission with Gemini 7. When the countdown reached zero, their Titan II booster abruptly shut down. For several long-ish seconds, no one was quite sure if this was going to be a replay of one of those awful 1950s-newsreel moments when the whole missile was going to explode. And why, an anxious America wondered, hadn’t the two pilots pulled their ejector rings? Apparently, Schirra, as command pilot, was exercising his prerogative to slow everybody’s roll rather than kill the mission – or, quite possibly, him and his co-pilot – over what turned out to be some kind of mundane plug glitch. “OK, we’re just sitting here breathing,” he calmly assured Mission Control. For this, he got another medal in addition to the one he received for carrying out the rendezvous three days later. Getting a medal for stillness rather than action – How very Zen! I wish I could find among the hours of broadcast footage from that day the black-and-white video of Schirra and Stafford as they entered the so-called “ready room” where they climbed into their Gemini cockpit hours before the aborted launch. Broadcasters always told you how conscientiously clean that room had to be with all those white-smocked launch-team personnel making sure no dust or dirt entered the spacecraft with the astronauts. The first thing Schirra did when he got off the elevator was walk over to a far corner to rub his gloved finger over a rail. He turned in mock outrage to show an imaginary speck of dust to the crew chief. OK, maybe you had to be there. But this bit preceded one of history’s more frightening moments and here was Mr. Annapolis-grad-veteran-test-pilot performing low comedy as if it were beer call instead of T-minus-whatever. Schirra achieved an above-average measure of fame for Gemini 6, and for commanding the first manned flight in the Apollo program in October, 1968 – when he caught the head-cold heard – or groused about – round the world. His name still didn’t glow in the dark as brightly as Glenn’s did, or Armstrong’s would. Still he got more famous after he quit the program to become an on-air analyst for CBS News; playing, if you will, John Madden to Walter Cronkite’s Pat Summerall throughout the lunar-landing phase. He died in 2007 at 84. He would have been fun to hang out with, even though his politics were so deeply right-wing Republican that he said Glenn was the only Democrat he’d ever vote for (and I’m not altogether sure of that.) Still, laughing came so naturally to Schirra, as Norman Mailer once observed, that you were sure he could overlook any differences you had with him and chuckle over old times, his and yours. BILL STOUT (CBS): Even though you’ve been there before, how do members of the Schirra family feel about the coming flight? SCHIRRA: I’m sure there’s always a degree of apprehension. I hope there’s not fear. I hope to dispel fear by dispelling ignorance. And if I can explain the details of what were doing in our mission satisfactorily to you and to your audience, then possibly you know that’s what I’m trying to do for my family. To make them aware of what I am doing. If I’m old enough to fondly remember Wally Schirra, then I’m also old enough to remember when dispelling fear by dispelling ignorance was a primary directive for everyone in American life regardless of where you stood on the political spectrum. It could be again, someday. In the meantime, follow Captain Wally’s example and laugh at the scary stuff. It’s good for you.